Dents, scuffed bumpers, wheel scrapes, scratches, and more all decrease the value of, and detract from, a vehicle's overall appearance. With over thirty years of experience removing dents and other exterior damage, Dent Wizard is the leader in automotive SMART reconditioning. Our exterior repair services improve the overall aesthetic appeal of vehicles while enhancing their value. 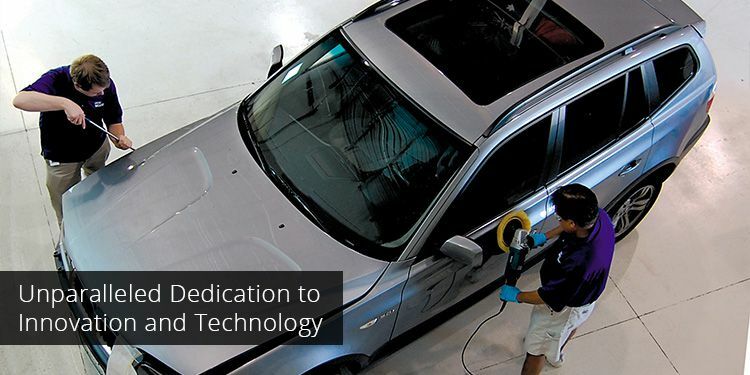 With an unparalleled dedication to innovation and technology, Dent Wizard has been finding new ways to repair vehicles while avoiding costly body shop repairs. Our service is un-matched and our technicians continually receive training on the newest technology available for automotive reconditioning. Dent Wizard provides SMART repairs to a variety of fleet and vehicle-based businesses. Learn about partnering with Dent Wizard to improve your business today. Scratches, scuffs or worse? Give your vehicles a factory-new appearance. Learn more. From scratches, gouges and corrosion to cracked or damaged rims, bent wheels and peeling clear coats, Dent Wizard's Wheel Repair services are the remedy for all types of wheel damage. Learn more. Give vehicles a facelift by removing the yellow, foggy oxidized look from headlights with Dent Wizard's Headlight Brightening services. Restore headlights to their original brilliance and clarity. Learn more. Restore vehicles look by repairing paint chips and scratches caused by everyday driving with Dent Wizard's Paint Chip Repair. Learn more. Quickly repair windshield cracks and chips with Dent Wizard's Windshield Chip Repair services. Learn more.